The concept of hospital environment based on the precepts of cognitive ergonomics expands the understanding of hospital ecology. It encompasses the dimensions of relationships, the physical structure, and the way these two interact with the activities that occur there. Ambiance then becomes an important factor in breaking preconceived ideas of what healthcare spaces should look like. This contributes to the construction of new situations that may come to transform paradigms of healthcare spaces. It shows that both Ergonomics of the built environment and Ergonomics in the design process play a relevant part in the betterment of healthcare spaces. As such, the goal here is to understand the relationship between users and the environment, assessing whether it meets the needs of children and their caregivers. 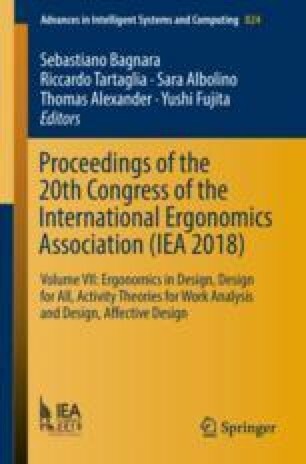 This paper discusses conceptually the use of cognitive ergonomics as a tool of inter and transdisciplinary ideas in the design process of the built environment of children’s healthcare spaces. It seeks to understand how the integral needs of the users may become the focus – to the detriment of the disease-centered approach –, with more humanized spaces adapted to their expectations and needs.